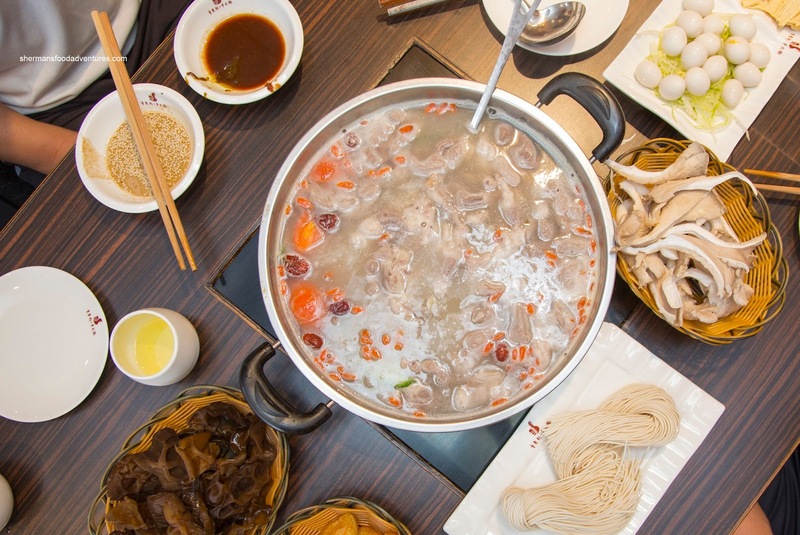 Normally, dining on Chinese Hot Pot in the middle of August might not be the best idea even if there is A/C. That reminds me of the time we did that at Costanza's house where there was no A/C. Let's just say his house doubled as a sauna while we were scratching our heads as to why we would try to pull off such a stunt. Well, it was lucky for us this time around because it was cloudy and really not all that warm. 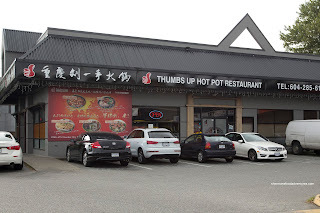 It was after our first 3 games of our annual softball tourney and we decided to try out Thumbs Up Hot Pot (where So Hot So Pot used to be). By virtue of being an a la carte establishment, we were intrigued to see if it would cost us more or less than an AYCE joint. 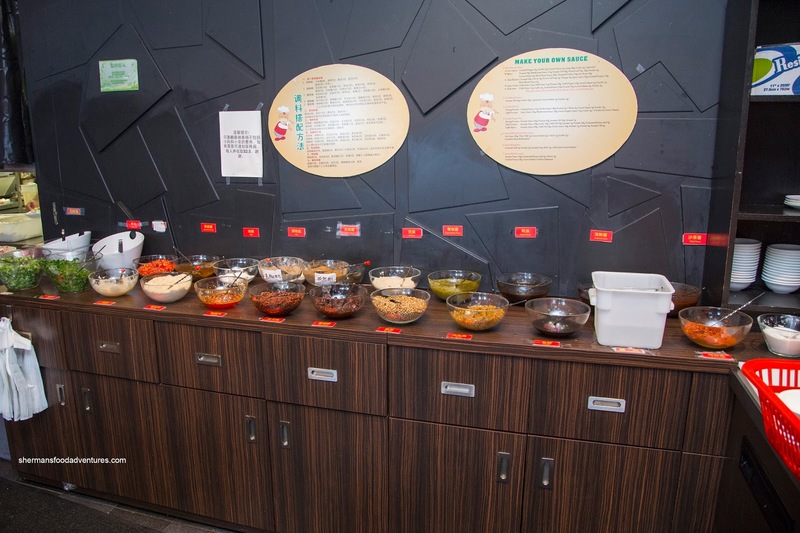 Furthermore, we wanted to see if the quality of the ingredients would be better as well. One thing that did take us by surprise was their "build your own" Sauce Bar that boasted over 26 items. I decided on a combination of mustard greens, chili sauce, vinegar, soy, sesame oil, sesame seeds and satay sauce. As for our broth, we went for a straight-up Pork Rib Soup that featured wolfberries, tomato, pork bones, dates and melon. It was rather subtle without an over-reliance on salt and MSG. 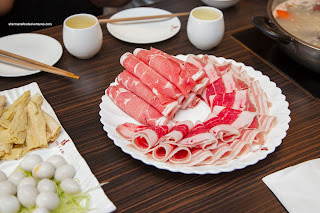 I actually enjoyed eating the soft pork meat from the bones. 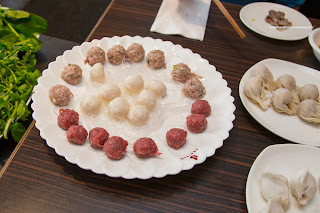 For our eats, we got a plate each of the Meats (Beef, Pork and Lamb) and the Meatballs (Beef, Pork and Cuttlefish). Although the amount of thinly sliced meats didn't look like a whole lot, it was sufficient for us. It really put into perspective how much we over order and subsequently over eat at AYCE hot pot joints. In terms of quality, it was definitely there with buttery beef and lamb while the pork was equally tender. The freshly made meatballs were on point as well where the beef was meaty while still tender and bouncy. The pork was soft and nicely seasoned with some green onion. Exhibiting the classic rebound texture, the cuttlefish meatballs were also good. 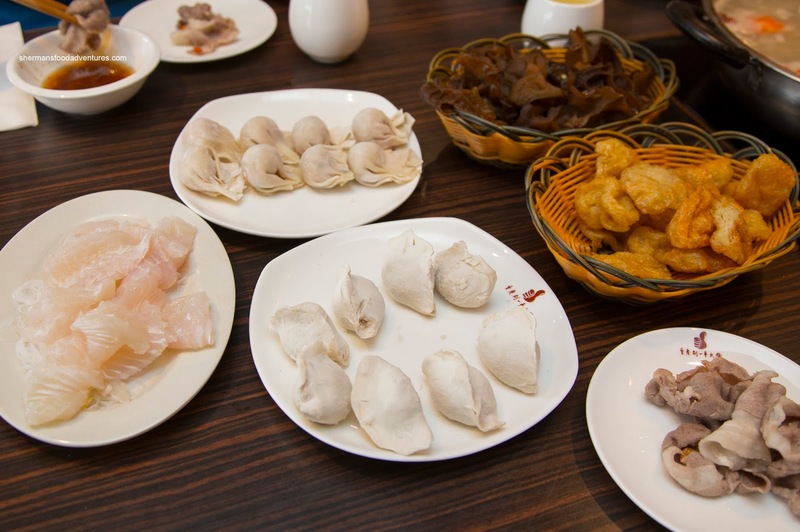 Onto various items, we had Fish Slices, Wontons, Pork Dumplings, Woodear Mushrooms, Fried Gluten, Fresh Noodles, Bean Curd Sheets, Quail Eggs, Spinach and Watercress. Nothing was amiss with any of the items, but we did think the dumplings could've been meatier as there was more vegetable than pork. 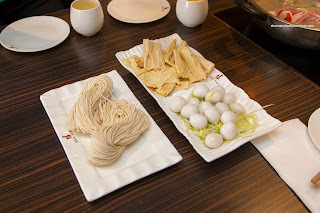 We enjoyed cooking the noodles last in the broth and they were appealingly chewy (since we didn't overcook them). At the end of the meal, the cost per person came out to under $30.00 including tax and tip. Compared to the $34.00 we paid at an AYCE place down the street earlier in the year, it was indeed cheaper. Sure, we could've ordered more food, but it was really enough for us.